Our real estate office and agents receive the newest statistics at the beginning of each month which we use for our market analysis. 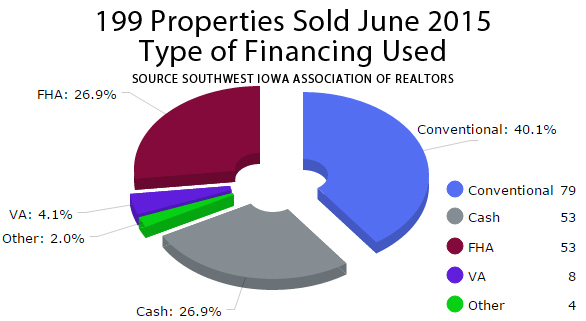 The chart above represents the 199 properties that were sold during the month of June. Over 40% of the transactions were completed with conventional financing with cash and FHA transactions representing over 26% of the sales each. This shows that most people are not paying cash for area homes and are signing up for low interest mortgages. The chart above shows homes are selling quicker this year than in previous years. 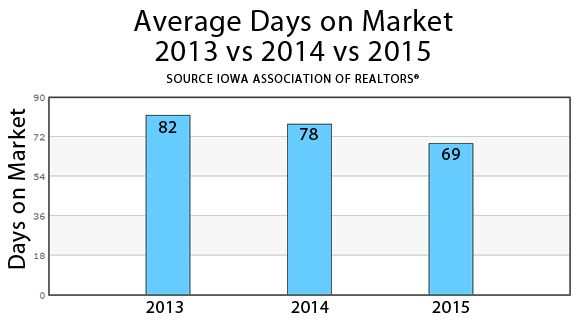 There are more buyers on the market in 2015 than there were in 2013 or 2014 and this means we have happier sellers in the Council Bluffs and Omaha area (and busier real estate agents). Staying up-to-date on market analysis is an important part of making any real estate transaction smooth and successful. Our agents love to stay current to provide the best service possible to clients. To find out more about our Morse Real Estate Realtors®, click here.